Based on the Victor Hugo novel and songs from the Disney animated feature, The Hunchback of Notre Dame showcases the film’s Academy Award-nominated score, as well as remarkable new songs and music and is the only stage collaboration between two legendary masters of American musical theatre, Alan Menken (Disney’s The Little Mermaid, Beauty and the Beast) and Stephen Schwartz (Wicked, Pippin). 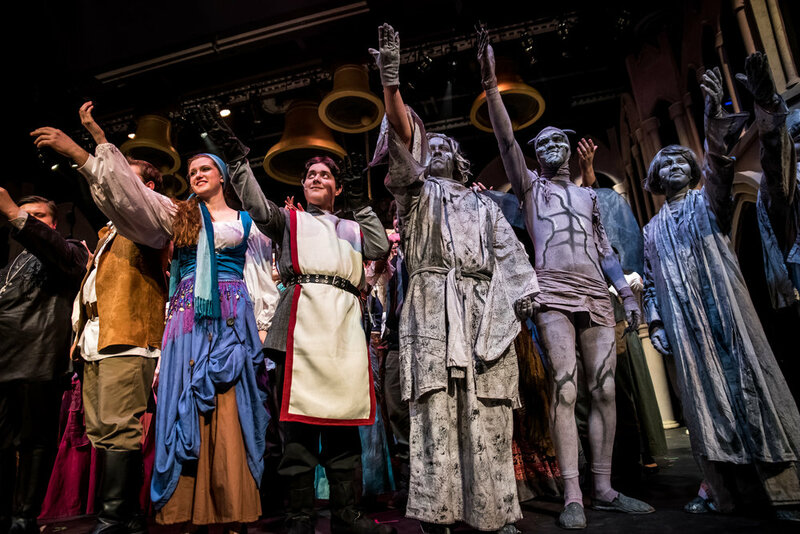 North’s premiere production features a cast, crew, and orchestra of more than 100 students as well an elaborate set depicting 15th century Paris, including a set of custom made cathedral bells, stunning special effects, and breathtaking original costumes. This daring and moving production sets the classic tale of love, vengeance, and compassion to one of the most sweeping scores ever written for the stage. The story begins as the bells of Notre Dame sound through the famed cathedral in fifteenth-century Paris. Quasimodo, the deformed bell-ringer who longs to be "Out There," observes all of Paris reveling in the Feast of Fools. Held captive by his devious and hypocritical caretaker, the archdeacon Dom Claude Frollo, he escapes for the day and joins the boisterous crowd, only to be treated cruelly by all but the beautiful gypsy, Esmeralda. Quasimodo isn’t the only one captivated by her free spirit, though – the handsome Captain Phoebus and the secretly impious Frollo are equally enthralled. As the three vie for her attention, Frollo embarks on a mission to destroy the gypsies – and it’s up to the maligned and mistreated hunchback, Quasimodo, to try and save them all. For ticket information, contact the North Theatre Office at 997-3994 or by e-mail northboxoffice@gmail.com .